A show like no other! This was the inaugural year of Tiki Oasis AZ at the magnificent Valley Ho Hotel, a mid- century masterpiece in downtown Scottsdale. Imagine being swept away to a faraway place and time traveling to a 50’s Hawaiian luau. Everyone is period correct, over the top and loving every minute of it. We were in heaven, this Polynesian paradise exists only two times a year and we at Modfire had a blast. This is a sister show to the infamous Tiki Oasis San Deigo, I’ve only heard stories, like the “up and down bar” in the hotel elevator that serves drinks to it’s passengers. We officially launched Tikifire and as you can imagine it was a huge hit. The god of fire ruled the night. The hotel grounds were a beautiful backdrop for our Modfire booth, I think it looked amazing. Spending time with my lovely wife was also one of the highlights this weekend. She loves a good themed party. 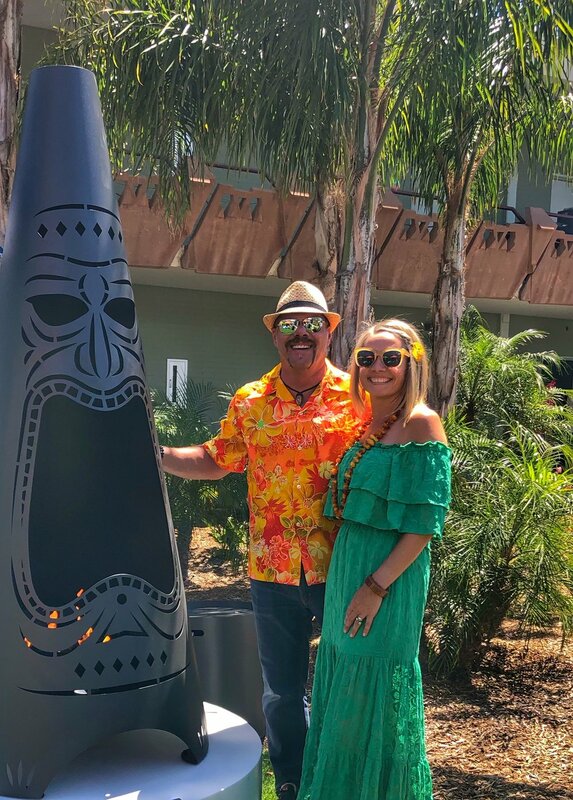 So great to pose with Miss Tiki Oasis in front of the “Big Kahuna” look at us, we match!